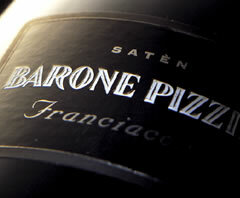 De Wijnspecialist.be - Wijn: Franciacorta DOCG "Saten"
The "Saten" has a velvety feel in the mouth, it can be served through a meal from aperitivo to white meat and cheeses. The grapes are organically grown and will soon get the certification. The italian version of Champagne but with riper grapes and a softer, elegant taste for half of the price.